Travel with Kevin and Ruth! : Grandkids for two weeks! That's a bit of a long drive doing all the way to Regina and back in one day. From here to the airport was 309 kms (192 miles) one way. I filled up with gas in Swift Current, and then filled up again at the same station on the way back. Figured out that the little blue car got 38 mpg keeping the cruise control right at 100 km/h (62 mph). Made it to the airport at about 11:15. Got my automatic parking ticket in short term parking where it's $2.00 for a half an hour. Lindsey's plane was due to arrive at 11:30, but it was a few minutes early. While I was waiting, I went and paid the $2 charge at the pay station, figuring that there is enough of a delay between paying and leaving that they wouldn't ding me for another half hour even if I was a few minutes late. Sure enough, Lindsey and the kids came out of the arrival area quickly. There's Sadie, coming down the arrival escalator. She recognized me right away with a big smile. (Video calling is a wonderful thing!) She ran right over and grabbed my little finger to hang on to. She's such a sweetie. Mom went in to use the bathroom, and left me with the kids. Cameron went to the little boys room by himself, so it was just me and Sadie. Sadie is all smiles. Still hanging on to my little finger. Cameron came out quickly, and started exploring. Pretty soon, he was on the phone ordering us up a hotel room! Cameron, looking for a hotel room. Too funny. Regina is just a small airport, and we didn't have to wait long for the car seats to arrive at the oversize luggage area. Got out to the car, and everybody settled in for the three hour return drive. By this time, it was about 11:50am, and had I waited until then to pay, it would have cost us another $2. Sure enough, the machine accepted the ticket I had paid for earlier. Hey... two bucks is two bucks. Better in my pocket than theirs. It rained most of the way back, but by the time we got to Swift Current there was actually some sun shining. The kids had slept in the car for a while. We went to the town of Cabri and picked up some library books and filled the propane cannister I had brought with me. Finally made it to the park around 4:00pm. Grandpa and Sadie cooking kabobs for dinner. 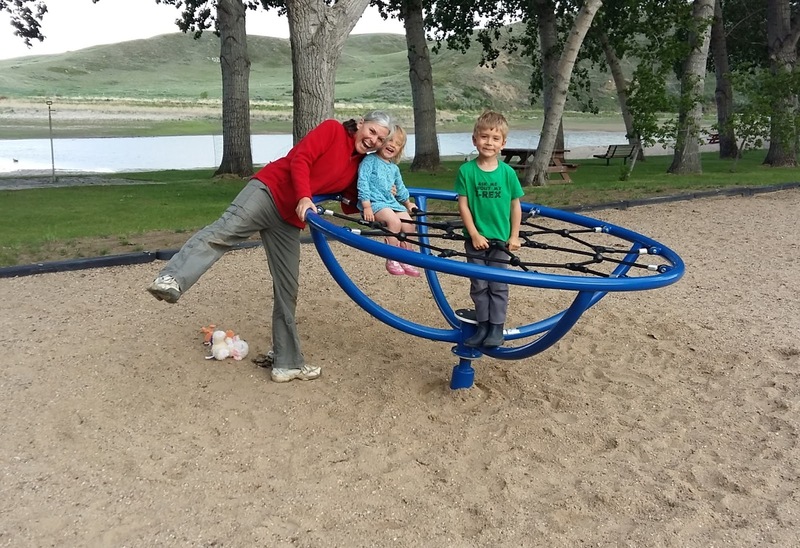 Grandma with Sadie and Cameron at the playground. And so it will be fun to spend time with our daughter and the kids for two weeks! They sure are coming out with some neat camping lanterns. This one has a lithium ion battery and fully charged it will last for 400 hours. That's amazing, especially for the price! Oh such great times with grandkids - I tell my daughter 'If I'd known the grandgirls would be so much fun ... I'd had them first!' Enjoy! We are enjoying our time so far and really having some good laughs with them! :-) Kids say the darnedest things! Enjoy the visit Grand-kids grow up even quicker than than your kids do. Couple of eye blinks and they are in High school..
Did you ever think about selling bulk propane at the park? They sure do grow up faster, especially when you don't see them as often as you would like! In Canada there are way too many regulations for selling propane, it just wouldn't be worth it here at the campground. So nice to see the family visiting. Have a fun filled two weeks. Will be fun to spend the time with the grandkids, I am sure they will keep you guys busy. Love the photos! Happy faces tell it all! Cameron and Sadie are growing up so fast. So cute!! Yep, the happy faces say it all for sure! They really are growing fast, I can't believe how much Sadie is talking now, it's incredible. Woo hoo! Let the fun begin! That last picture sure is a great picture of Ruth and the kids. enjoy the time with the grandkids!! they are adorable!! We intend to enjoy every minute of their visit! Yes, they are very adorable but then, we are a little biased. Adorable Grandkiddos! Sadie looks like a "Grandpa's girl!!" Love to see the smiles on everyone's faces. Sadie is definitely a Grandpa's girl for sure! It's not hard to have a smile on your face with them around.